This has been a year for new beginnings. And wow I am so excited about where we are headed with our dogs. I can see great promise with the dogs I have coming up. The Tom Coen seminar helped me get a better vision of where I am going with my breeding. The puppies/dogs I have coming up look very promising. My husband is starting a new business and I am very proud of him. Our son Michael is still a handful but a very big joy in my life. Our oldest son John is 21 now and doing well on his own. We are very proud of him too. So as for the year I am happy with the things I have learned this year. I also have to add that I am very excited to see how our newest litter will turn out. I melt every time when I look at them. They all are so pretty. They all have very pretty heads and are just very pretty. I am also very proud of Grace she is the best mommy. She will do circles and she will not step on anyone of them. Or if she hears one making a noise she will check it out. She is a great mom, and a love bug too. I had to take a chance to introduce some of our up and coming girls here at Daedream. 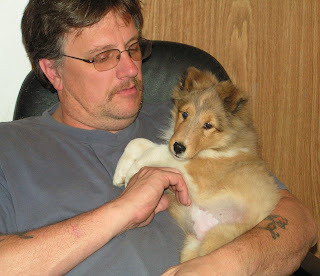 The 1st picture is my husband Todd and my sweet baby girl Jenn "Daedream Movie Star" She is a very sweet loving girl. She loves to be cuddled and held. 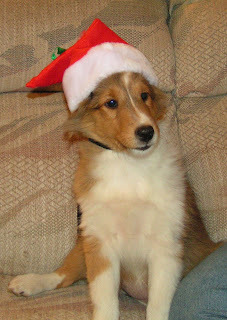 Our little santa girl is Jenn's litter mate Aruora "Mtn Mysts Daedream Morning Star. She is also a cuddler. Below is another litter mate Tori "Daedream She's A Star". 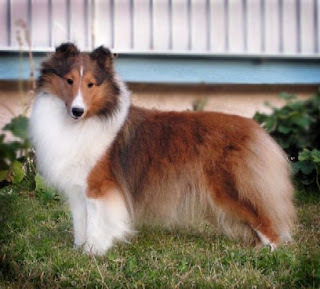 They are from Mtn Mysts In Pomous Dress x Multi Specialty BIS CH Sandance Ardastra. Jenn and Tori will be staying here for the time being. But we will may let one of them go because we don't need to girls from the same litter. But I am having a really hard time picking which one I want to keep. Because I just love both. 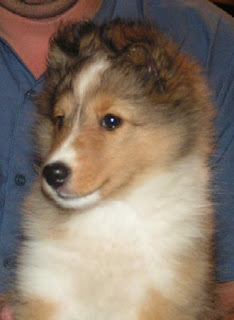 But Aruora will be going to Mtn Mysts Shelties in CO. I love her too but I couldn' keep them all. We are very excited about them. 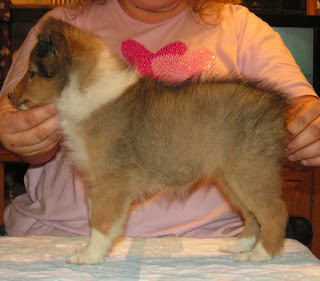 This litter was co-bred with Toni Pomasl of Mtn Mysts Shelties. We also have our newest litter co-bred with Shannalee that I have been talking about . Graces litter, they have their eyes open today and they are so beautiful. What a Christmas Present to see their sweet eyes. They all have very blocky heads at this point. And I am very excited about them too. After restarting our Sables this year we have some very pretty prospects coming up. I can not thank the people who helped in that enough. Shannalee, Beki Vale, and Toni Pomasl. These 3 special ladies have been a very special part of the sables you see on this post. I am so excited about them and can not wait to see how they all turn out. Thank you ladies for these lovely babies that you all have been part of. I am very excited about the Grace puppies today their eyes are starting to open and they get more beautiful each time I look at them. They are very plump and so beautifully marked. 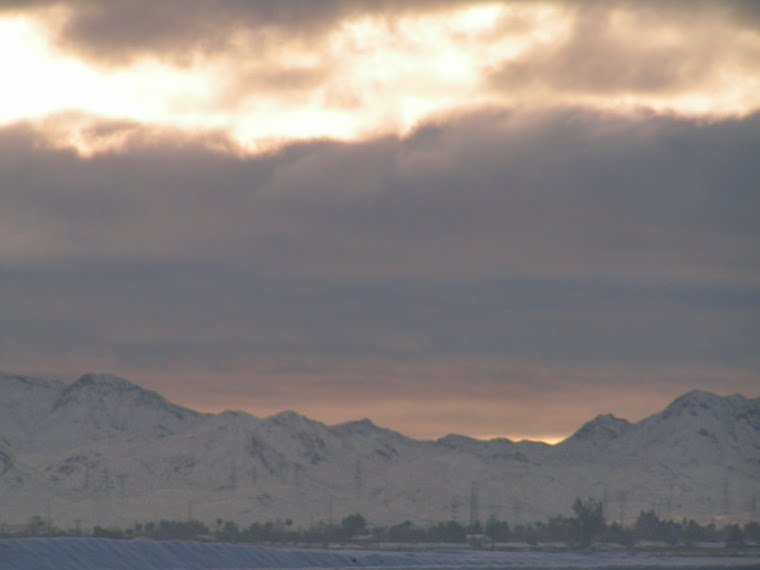 It looks like we might have a chance for snow tonight again in Las Vegas, NV if it gets cold enough tonight. It would be so awasome if it really happened. It would be the 1st time we ever had a White Christmas in Las Vegas, NV. And it would be my 1st White Christmas too. Daedream Shelties would like to wish everyone a Merry Christmas! May all your Christmas Dreams come true. Here is our most recent picture of Grace. She is all grown up now. She will be headed out with Shannalee as soon as she is recoated and done with her babies. We are very proud of this girl. It is almost Christmas and we have a new litter of puppies we wanted to show off. Grace had her babies 1 week ago and they are very pretty. We are very hopeful they will hold great promise. This will be our Christmas song themed litter. 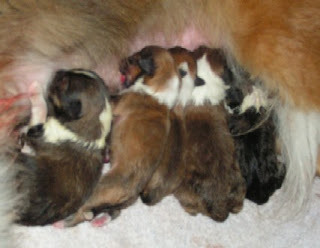 One of these babies will be going to Shannalee of Akadia Shelties.